Perfect for home, office, and car. It includes the 6 feet AC power adapter (UL Listed), ensuring maximum usage whether at home or in the office. Also Includes a FREE car adapter. Speed and Direction Control: Three custom speed modes offer you a customized deep tissue massage experience. 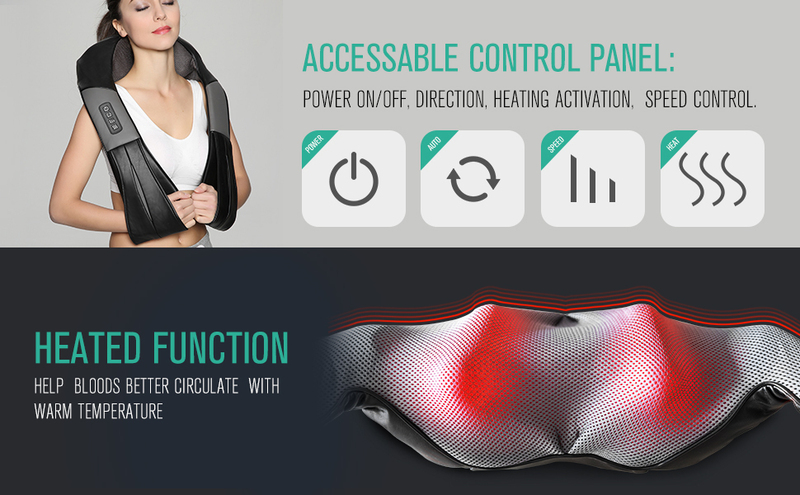 Direction control offers Bi-directional movement control to mimic the motion of in-person massage experience. If the connection seems loose, Please try to push the connector little further with force. Let stress melt away with the help of this versatile Shiatsu Massage Pillow. 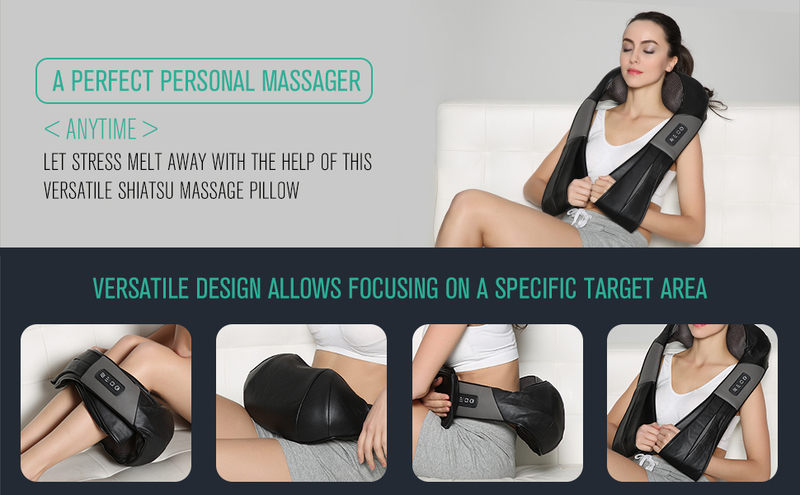 Designed to target troublesome spots in your neck, lower- & upper-back and shoulders, the pillow features 8 deep-kneading Shiatsu massage heads to soothe and invigorate sore muscles. select massage with or without heat for added comfort. Ultrasoft fabric provides a soothing surface, and an attached remote control permits easy operation. The massager it designed to deep shiatsu massage, if you feel too it's hard, try to apply less pressure on the massager. try to use a towel in between of the massager and your body to reduce the pressure, when you get used to the pressure, you can remove the towel for better experience. Heat function is too hot and burn my skin. Heat can be turned off manually. Friction between the massager and skin can generate heat, So, it's NOT recommended to use the massager for too long at a time. it's not recommended to use the this massager with clothes off/ naked body. Note: If the connection seems loose, Please try to push the connector little further with force. HIGH EFFICIENCY SOLAR PANEL: These solar lights feature high efficiency solar panel with 12 super-bright LED generating 210 lumens of light. It has built-in rechargeable battery with 1800mAh capacity. This new and improved solar panel offers longer working time and super bright lights. TWO ENERGY-SAVING MODES: These awesome motion sensor lights have 2 modes to choose from. First, the Auto On/Off & Bright Mode which means that the light automatically turns on at its maximum brightness when motion is detected at dusk and completely turns off when no motion detected. Second, the Dim & Bright Mode which means that the light will automatically turn on as dim at dusk or when no motion is detected and at its maximum brightness when motion is detected. LONG DISTANCE MOTION SENSOR: It also features a longer distance motion sensor. These light can detect motion with up to 5 meters in distance. WATERPROOF IPX5 RATING: These solar lights are rated Waterproof IPX5. It has a rugged weatherproof design so you don’t have to worry about the lights getting splashed with water. The air hole prevents the vapor from condesation on the internal area. EASY INSTALLATION: Installation is super easy and can be done just in minutes. No wires or adapters needed! It’s a great outdoor light for your garden, yard, aisle, porch, patio or driveway! Perfect for home, office, and car. It includes the 6.6 feet AC power adapter, ensuring maximum usage whether at home or in the office. Also Includes a FREE car adapter. Portable design allows to carry easily and use in the car, office, and home. Perfect for home, office, and car. It includes the 6.6 feet AC power adapter (UL Listed), ensuring maximum usage whether at home or in the office. Also Includes a FREE car adapter. The powerful 3100mAh Li-polymer rechargeable battery can effectively provide 100%+ extra battery life to your iPhone 7 4.7-inch, which is equivalent to add 14 + hours talk time or 10+ hours web browsing time. Designed specifically for iPhone 7 4.7 Inch with full-body ultra slim protective battery case designed with minimum added bulk. Enjoy the comprehensive protection while still maintain the slim of your iPhone 7. Apple Certified connector: which means it’s made with apple certified connector so you can expect quality performance and reliability. Worry-Free of compatibility or safety issues. No errors whatsoever. Featuring sync-through technology that you can sync your iPhone to a computer without having to take the battery case off. Simultaneously charge your iPhone and battery case together with the included microUSB cable. QUALCOMM QUICK CHARGE 3.0 TECHNOLOGY: Charge up to 80% of the battery with Nekteck 10050mAh Portable Charger for QC 3.0 compatible devices in just less than 35 minutes. QC 3.0 is also backwards compatible with USB, QC 2.0 & 1.0 and can deliver twice the charging speed of QC 1.0. 10050mAh BATTERY CAPACITY: Recharge your phone, ipad, tablet and other gadgets multiple times with the 10050 capacity of Nekteck Portable Charger. This power bank can charge your iPhone 7 up to 4 times, Galaxy S6 up to 2.5 times and an iPad up to 1 time. HIGH SPEED CHARGING: It can power 2 devices simultaneously up to 18W total maximum speed (Output 1: 5V/2.4A max, Output 2: For Qualcomm QC 3.0 compatible devices outputs can be 5V/2.4A, 9V/2A or 12V/1.5A max depending on different models). Less charging time yet more charging cycles. SMART ALUMINUM DESIGN: This portable battery charger has a stylish and sleek aluminum design. It’s convenient and lightweight which is ideal for travelling and camping. The smart LED indicates the remaining power of the battery. SAFETY GUARANTEED: It is built with multiple protection system against overcharging, overheating, excessive current and/or short circuit. VERSATILE DESIGN: This awesome foot massager has 6 massage heads with 18 rotating massager nodes. It amazingly relaxes muscles, ease tensions and regulates blood flow. HEATING FUNCTION: What’s more amazing is that this massager has a heating function to help relieve pain on fatigued muscles and reduce foot pain. It’s very safe to use. This function can be turned on and off manually if not preferred to use. ADJUSTABLE HEIGHT: We make it more comfortable for you to use this foot massager with its adjustable height feature! It can be easily adjusted up to 3 levels depending on your preference and convenience. Truly wonderful! PORTABLE AND EASY OPERATION: You don’t need to bend down just to turn on the massager. You can access the power button and set its mode by just simply touching it using your toe! Plus, it has a built-in on-board cord storage and carry handle for your convenience. PERFECT FOOT STRESS RELIEVER: This amazing massager is the one thing you need to ease tensions and relieve foot muscle pain. It is perfect to use at home and in your office! Get a good foot massage without spending a fortune in salon fees! Installation is easy DIY and the solar powered light can be installed in minutes, no wires or adapters is needed. Automatically turns on as dim mode at dusk and off at dawn, Also, when motion is detected it provides max-brightness illumination for security and safety protection for your property all night. Can be easily disassembled as a portable flashlight or lamp for emergency use. MULTI-FUNCTIONS MAGNETIC MOUNT: The Nekteck Magnetic Universal Mount does one thing but for many purposes. Use it to safely hold your phone or keys or anything metal whether in your car, kitchen, office, bedroom studyroom or any areas at home where you need your devices to be mounted on the wall or on any flat areas. EXTRA SLIM DESIGN: It has a sleek extra slim design so it can be easily stick on any flat areas in your car or around your home. SUPER STRONG MAGNET: Does your phone or others things keep falling off from your car mount ? Worry no more! With 22 super strong Magnets hold, It guarantees that the base of the mount will solidly hold the magnetic head of the mount, to help keep your devices in place, regardless of road vibrations or impacts unlike any other mounts out there. SUPER EASY TO INSTALL: This mount is so easy to install. No tools required. Just stick it to any flat areas and you’re good to go . ROBUST BASE: This magnetic mount holder is 10 times easier to use than any other magnetic mount holder due to its simple and complementary design. It has a sturdy rubber base and a powerful magnetic head for holding all your devices. HIGH EFFICIENCY SOLAR PANEL: These solar lights feature high efficiency solar panel with 26 super-bright LED generating 450 lumens of light. It has built-in rechargeable battery with 3000mAh capacity. This new and improved solar panel offers longer working time and super bright lights.